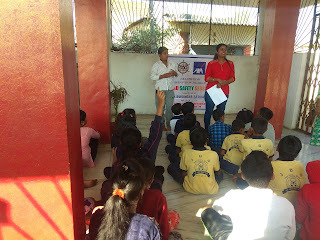 Chinchwad (Pune), 12-January-2019: The Don Bosco Development Society (DBDS), Chinchwad organized an interactive session on ‘Road Safety and Traffic Rules’ for the children of Dutta Nagar slum in Chinchwad. 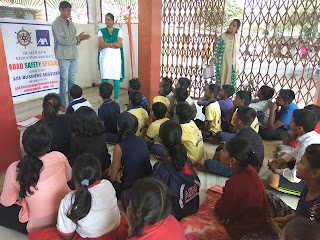 31 Students participated in this session held under the aegis of ‘Health Risk Reduction’ project supported by AXA Business Services Ltd.
Ms. Lalita Chaudhari (DBDS - Coordinator) and Mrs. Vibhwari Kamble (DBDS – Staff) were the resource person for this session. In their session they covered various DO’s and DON’Ts related to road safety. They also educated children on helping victims of road accidents. In case of accidents always call police by dialling numbers: 100 & 103. 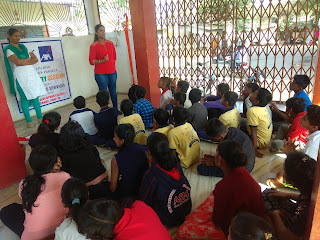 Then Mrs. Vibhwari Kamble spoke about personal health and hygiene. 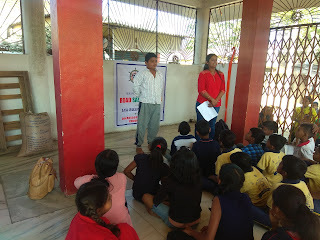 After the session snacks were served to all the children and Mr. Sarika Kadam (DBDS staff) proposed the vote of thanks.